During the second half of the 20th century, as a civilization, we have walked with Neil Armstrong on the Moon and driven in a robotic vehicle across the Martian surface. We have sent manned submer-bles to the bottom of the deepest ocean trenches and space vehicles toward the limits of our solar system. We have space borne telescopes that are beginning to peer into the universe billions of light years beyond and satellites scanning the Earth in minutes across distances that took explorers centuries to scope. We extract sediment and ice cores, revealing the Earth's history by geochemical assays with minute detection levels —often less than one part in a trillion. We are discovering biological fragments locked in rocks that reflect the emergence and extinction of species over millions of years. In the process of learning about the world around us, as the only species ever to step beyond the atmosphere and view the Earth system from outside we are beginning to understand our dimensions in nature across time and space (Part I: Earth System Science). Spreading across the Earth since the dawn of our evolution, the human population finally reached 1 billion near the beginning of the 19th century. By the first half of the 20th century, the human popu lation already had doubled and by the end of the century exceeded 6 billion persons. During this later period, India alone grew from 345 million persons in 1947 to a billion persons in 1999—an increase in one country within 50 years that the entire human population achieved across the planet in 500 years from 1350 to 1804 (Part II: Progress of All Mankind). Understanding the relationship between human population production and Earth system variability is as vital today as it was when our ancestors were living in caves. Now, we can survive beyond our biological adaptations, in otherwise inhospitable environments such as Antarctica, the deep sea, or outer space. However—in all cases—we still need food, energy, and material resources from the Earth. Satisfying these basic biological needs, in view of our growing global population, will increasingly involve solutions that extend across the planet (Part III: Our Dynamic Planet). Expansion of our civilization is an Earth system phenomenon affecting resources and habitats on a planetary scale. We have created agriculture, eliminated forests, and transformed landscapes. We have overexploited species on land and in the sea, even in the most remote parts of the planet. We have industrialized and produced chemicals that are being dispersed globally by the atmosphere. Compared to other species on Earth, the consequences of our production have extended from local to global scales over exceptionally brief periods (Part IV: Sustainable Resource Use). 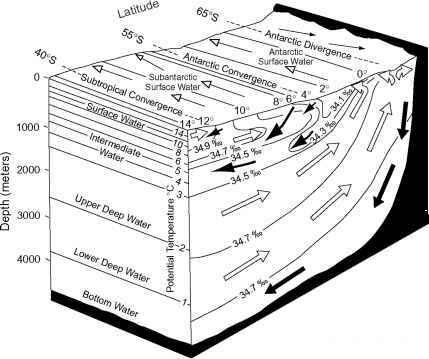 Antarctica is analogous to the Earth system itself. As a system, Antarctica reflects the time and space dimensions that are fundamental to understanding natural phenomena across the Earth, from the tectonic separation of continents over millions of years to the fluctuation of environments over seasons. Antarctica, with its ice sheets and climatic relation to sea level, also underscores the land-ocean -atmosphere coupling that cycles water around the Earth across glacial-interglacial periods as well as shorter periods. These habitat dynamics represent geological and ecological time scales associated with the evolution of species and persistence of their populations. 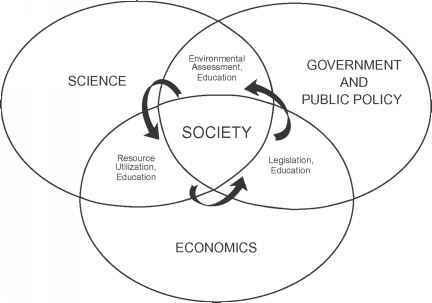 FIGURE V Integration of scientific, economic, governmental, and public policy perspectives for promoting and sustaining the common welfare of our global society. These interdisciplinary connections (Fig. 2.1) are at the heart of the Antarctic Treaty System and its international precedent in managing an entire continent for ''peaceful purposes only'' (Plate 8). Modified from Berkman (1997a). national aspects—representing a compressed history of the developmental stages in our civilization (Fig. 5.3). As Terra Australis Incognita, nations imagined the riches and spices of an uncharted ''new world.'' With advances in ships (new technologies of the era) nations began racing for priority—to be first—in the discovery of lands and resources (which were first seen around Antarctica by James Cook near the end of the 18th century). When finally discovered, nations quickly identified avenues of commercial gain as they exploited the largest, most accessible, and most profitable resources first, with species such as the Antarctic fur seal quickly being overexploited. tinents—there is no ''basis for asserting, supporting or denying'' those claims as long as the 1959 Antarctic Treaty remains in force. More importantly, with a view toward ''international harmony'' and the ''progress of all mankind,'' the Antarctic Treaty System has created a common vision among nations representing more than 70% of the Earth's human population. Human population and Earth system dynamics are global issues, embracing the inclusive interests of diverse stakeholders across the planet (Fig. V). Like a beacon, worldwide involvement and cooperation in Antarctica are precedents for humankind—radiating toward international stewardship of our global civilization.